Watch For Sale - Misc. Elvis Presley’s Omega wristwatch goes on the block during the auction house’s Geneva Watch Auction on May 12 and 13 at Hôtel La Réserve. At a charity event and concert in 1961, RCA Records, Presley’s label at the time, presented him with the 18-karat white gold dress watch set with 44 brilliant-cut diamonds on the bezel to mark his impressive achievement of selling 75 million records. The watch was purchased at Tiffany & Co. and features the retailer’s signature on the dial underneath the Omega designation at 12 o’clock. 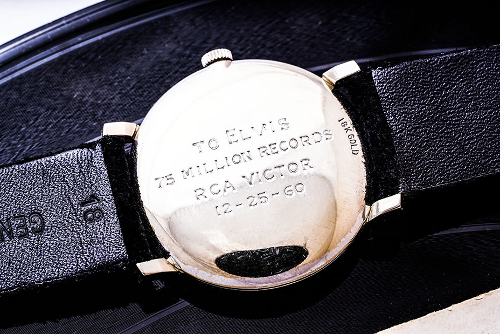 The case back bears the inscription “To Elvis, 75 Million Records, RCA Victor, 12-25-60,” commemorating the date that the sales milestone was reached. As the story goes, the uncle of the watch’s consignor randomly met Presley in a Las Vegas bar in the 1960s. After expressing mutual admiration for each other’s watches, Presley suggested to trade his Omega for the other gentleman’s diamond-set Hamilton on the spot, which they did. Presley’s watch was later passed on to its current owner, so it has never appeared on the market before. The estimate is US$54,000 to US108,000, the Elvis lore increases the estimate tenfold compared to what a similar watch would be valued at without it.